This weekend holds lots of activity as our annual Spring Community Weekend is held. On Saturday we have a speaker, Sr. Mary Ann Hinsdale, IHM, a professor of theology at Boston College. The theme for her two presentations is "Hoping for a Church We Can Believe In." 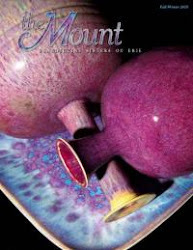 Sunday morning brings a special liturgy and annual Benefactors' Brunch as many of our friends and faithful supporters join us at the Mount. This year they will also get special tours of our renovated bedrooms and health care areas. It'll be hard to find a free vacuum cleaner on Saturday! A daylong 40-50 mph wind last Monday cancelled flights from our airport, interfered with computer and other electronic transmissions, and downed wires and trees everywhere. 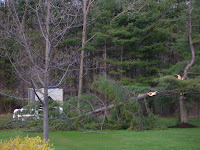 Half of this beautiful old evergreen in our east yard was down when we got home that afternoon. Here's a new bird to my feeder. Does anyone know what it is? 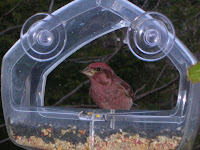 This is the male, with beautiful red coloring on its head and breast. The female is all brown, with just the slightest hint of red on its head. They were even feeding together side by side one day. On Wednesday we had wonderful additions to our prayer for Earth Day.